The late portion of the run was upgraded and that is what stalled the closure by about a week. Now we are being told that the announcement of a marine closure will likely come out on Monday, which means that it will be closed on Wednesday of next week at midnight. The upgrade in the late portion of the run allowed for a commercial opening and there were reports of as many as 35 seine boats out on Wednesday. That combined with the rain and low pressure (causing many holding fish to go up the river) definitely slowed down the fishing. It is pretty scratchy from the North Arm down to Iona and T-10 isn’t much better. If you are looking for some decent fishing you will need to head down to the South Arm to find some schools, but the sockeye season is winding down, just as it should be as we approach the third week of September. A successful day sockeye and coho fishing this Tuesday. If you are looking for some chinook action I would also head down to the South Arm in search of the big white chinook that are headed to the Harrison and Chilliwack/Vedder Rivers. They show up right about and are often the biggest fish of the year. They don’t hang around as much as the reds do, so don’t wait for a hot report, just go down and put in your time. Bait is the name of the game as always for chinook in this area. Fish 30-75 on the riggers with your favourite teaser head and flasher combos. 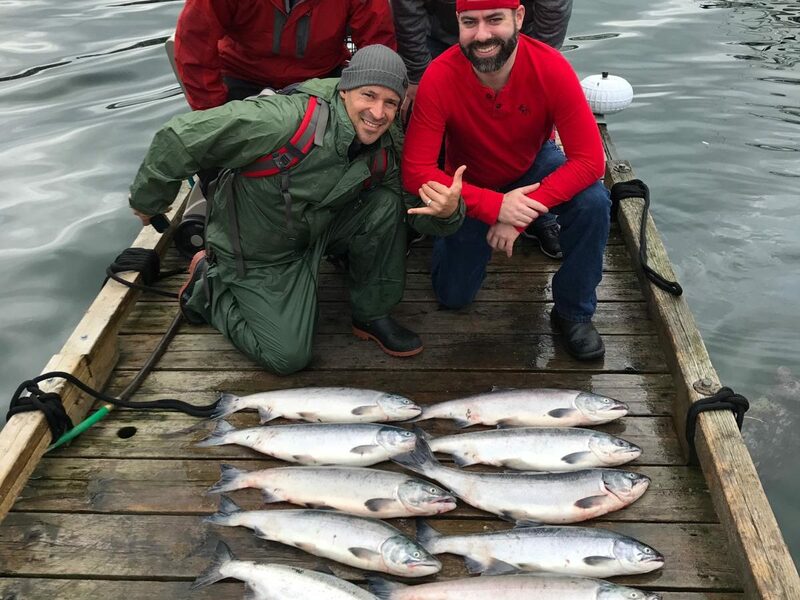 There is a good chance you will get into some coho as well, so be on the look out for a bonus hatchery coho that is likely headed to the Chilliwack/Vedder. Coho fishing in the harbour has slowed considerably from the last few weeks. The fish have been hit pretty hard and are starting to enter that “lock jaw” phase that staging coho are so famous for. We still managed some these past few days but the fishing slowed dramatically from earlier in the week. Vancouver Chinook Classic Weigh Boat Volunteers Eric and Tom had some luck on the water with Jason yesterday. The Cap Mouth is starting to produce some fish, right on time. We saw a handful of chinook taken there yesterday on the morning flood tide. The fishing is not hot yet but it should get better in the back half of the month as usual.